In recent years, there has been increasing discussion of whether philosophy actually makes progress. This discussion has been prompted, in no small part, by the depth and persistence of disagreement among philosophers on virtually every major theoretical issue in the field. 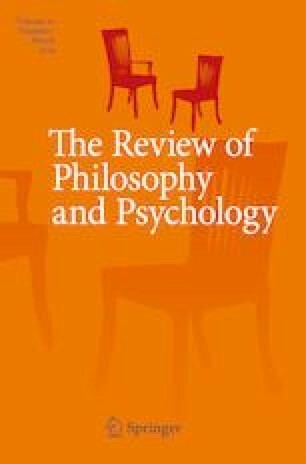 In this paper, I examine the role that the Method of Cases (MoC) – the widespread philosophical method of testing and revising theories by comparing their verdicts against our intuitions in particular cases – plays in creating and sustaining theoretical disagreements in philosophy. Drawing on work from cognitive psychology, I argue that there is a fundamental incompatibility between (a) the structure of the theories that philosophers seek to construct using the MoC and (b) the structure of the concepts on which our case-specific intuitions are based. This incompatibility renders MoC-based philosophical theorizing unable ever to succeed by the very standards of adequacy that it sets for itself. And this, in turn, helps to explain the depth and persistence of theoretical disagreements – and, in certain ways, the lack of progress – in the many areas of philosophy where the MoC plays an important role. I am grateful to the editors and three anonymous referees at The Review of Philosophy and Psychology for their helpful comments on an earlier draft of this paper. Precursors to this paper were presented at the 2017 Central Division Meeting of the American Philosophical Association, Yale-NUS College, and Nanyang Technological University; thanks to the audiences on each of those occasions for useful discussion. Special thanks to Liam Kavanagh for detailed feedback on a previous draft and for a number of helpful conversations on this topic. This work was supported by a grant from the Nanyang Technological University College of Humanities, Arts, & Social Sciences (project M4081899.100).